Rain did ease off during Saturday. We called in to a new cafe which will open next week, run by some friends of ours and will be blogged! Later we took a drive around the NE part of Phuket around Bang Pae and Bang Rong. Wanted a drink at the floating restaurant, but it was closed for Ramadan. The scenery in this area if you follow some of the back roads is fantastic and the local lifestyle is a million miles from the tourist beaches. Saturday evening and the rain was back again for a while as we enjoyed a kids birthday party. Fortunately not raining this morning so I stayed dry on the ride to work, but it did then rain most of the day! When it was only spitting I made a run for it... I wanted to stop and take a photo on the edge of Patong. All the development, especially in hilly areas, sometimes causes too much soil erosion. And the building is sometimes not the best quality. My advice - if you want to buy a house here in Phuket , get one on flat land and not right under a muddy hill! This little mess is just outside Patong. There was a place called "Oktoberfest" here, but it seems to have been demolished anyway a while ago due to lack of interest. 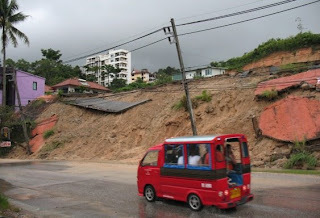 Funnily enough, I just found a post on the Phuket Info Forums showing a big crack in the concrete and someone says "This looks like a landslide waiting to happen!" And then right after hurricane Gustav, there was Hanna which has caused all kinds of havoc in Haiti, and now Ike is bashing things up... and has a path very similar to Gustav. If you're from New Orleans, you might want to batten down the hatches again. A little rain is nothing. We need rain.